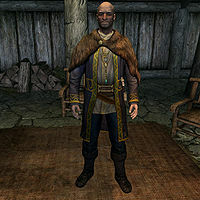 Rorik, a Nord warrior, is a former member of the Imperial Legion and founder of the small farming community of Rorikstead. Rorik fought bravely against the Aldmeri Dominion during the Great War but was wounded and brought to Jouane Manette, then a skilled healer. After his recovery, and while the Great War still raged across the land, Rorik bought the vast countryside later to be known as Rorikstead and managed to work the lands against all odds. The town is home to his old friend Jouane, with whom he shares his manor in northern Rorikstead. Even if he is not particularly wealthy, he wears a set of fine clothes with matching boots. When he goes to sleep at night, he slips into a more comfortable belted tunic. He wields an iron sword and carries the key to his manor. Rorik begins the day at 6am when he gets out of bed. Now awake, he will head out into Rorikstead and wander around until midday. Around noon, he will head back to his manor to eat. After eating, he will head to the Frostfruit Inn, where he will spend the majority of his afternoon. He will leave the inn around 6pm to return to his home to eat again. After taking an hour to eat he will once again visit the inn, where he will spend the last few hours of his day. He will finally return home around 9pm to go to bed. Rorik will sleep until 6am, at which time he will wake up and repeat his schedule. When you approach him he makes it quite clear that he is not much for talking: "If you've got some business in Rorikstead, you should start by speaking to Jouane. ", "Sorry, I don't mean to be rude but Jouane's the one who deals with people. I'm afraid I lost my charm years ago." and "No offense intended, but I don't think we have anything to talk about." He will also say, "I was a different man, once -- strong, commanding, ah, and young. But the Great War was a long time ago." Rorik can be asked about the name of the town, his involvement in the Great War, and about the Civil War's effect on Rorikstead. "Is the town of Rorikstead named for you?" "Yes, that's right. Look around you. Most of the lands you see are mine. Most of this I purchased while my comrades were fighting in the south, helping the Empire against the Aldmeri Dominion. Back then, nothing would grow here and so the land was worthless. Now, thanks to hard work and the gods' blessings, our farms prosper." "Did you fight in the Great War?" "Aye, that I did. I commanded a force of several dozen men, most of them levies from villages in this part of the hold. I damn near met my end in that war. An Aldmeri soldier ran me through with his blade and left me for dead. A healer named Jouane saved my life. He's been my closest friend ever since. I tell you, that man is a miracle worker." "Has the war taken a toll on your settlement and its people?" "Not yet, anyway, though it certainly could. With most of the hold's fighting men committed to the war, there are fewer swords to keep the roads safe from brigands and wild beasts. And of course, as the war drags on and supplies run low, our ample fields and stores of food will make a tempting target for desperate men. The best we can hope for a swift end to the conflict. The longer the war goes on, the worse it will be for all for [sic] us, I'm afraid." As the founder and owner of most of Rorikstead, Rorik holds a number of conversations with the residents of the town. Most notably he will converse with his friend, Jouane, about the harvest. Rorik: "Maybe you're right. Even so, I can't help wondering if some other force is at work here." He will comment on the growth of Britte and Sissel to their father, Lemkil. Rorik will ask Reldith about the progress of their planting. He will compliment Ennis on his business skills when he speaks to him. 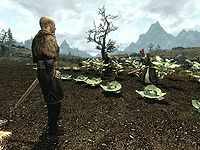 Rorik: "I hear your crops sold well at the market. Well done, Ennis." Ennis: "I'm trying something new, offering discounts for bulk purchases. So far, that seems to be working." Rorik will talk to Erik about the benefits of local living. Jouane will talk about his and Rorik's involvement in the Great War if asked how he came to live in Rorikstead: "Have you met Rorik? He owns these lands, and it's from him that our village gets its name. We have been friends for many years now. Rorik fought for the Empire in the Great War. He was gravely wounded, and so was brought before me. I was a healer then, you see. We were as close as kinsmen, and when Rorik returned home I came with him. I am happy to spend my twilight years here with my good friend." While patrolling around town he was supposed to make a number of comments about the benefits of working as a farmer, conditions of the local farms, and the bountiful harvests: "Nothing refreshes the soul like an honest day's labor in good, tilled earth. ", "It's remarkable that our farms are so prosperous given the harsh winters of late. ", "Looks like it's going to be a bountiful harvest once again. The gods continue to smile upon us." However, he will just watch the workers in silence. ?